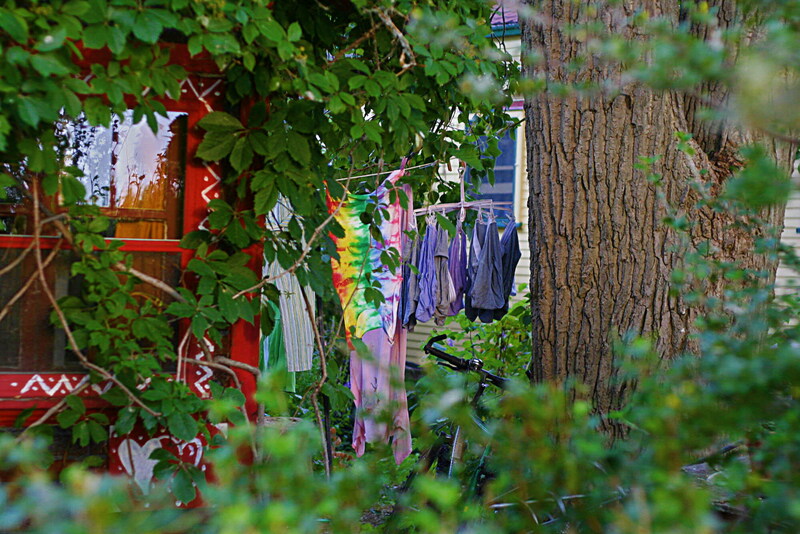 Ryan's Photo Blog: Color is it the same for each of us? Do we all see colors the same way? The simple answer is no, otherwise why would some people dress in such awful colors. 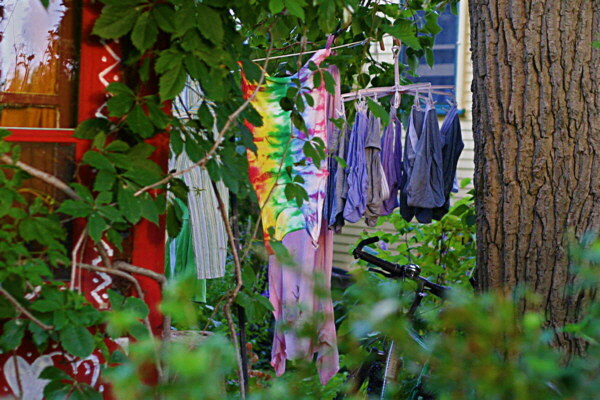 This is not to imply there is anything wrong with the colors of the clothes on this Wards Island clothesline. We also know that some people have various levels of color blindness making it difficult for them to differentiate between colors. There is often confusion between what we know as color because we can see it with our eyes and the scientific description of color being the wavelength of light in the visible spectrum somewhere in between the short wavelength near-ultraviolet and long near-infrared wavelengths. If a prism was used to split up sunlight the resulting spectrum would look like the diagram below. If we had a light meter to measure the intensity of the light along the x-axis (= wavelength) we would have a spectrometer. The spectrum of the sun is wideband as the sun has light at all wavelengths. If you could look even closer at spectrum you would see very fine peaks and valleys of intensities this is called the fine line spectrum caused by some element of the sun emmitting light. Many sources of man made light but excluding the the good old incandescent light bulb are narrow band emitters having just a few narrow lines in their spectrum, devices such as lasers may have only one narrow line. What does this have to do with how we see colors, actually very little. Unlike our ears where we can hear minute differences in frequency (1/wavelength), intensity (volume), in pronunciation and in enunciation (sound envelope) our eyes were not designed for such subtle distinction. Eyes can only detect 3 wide overlapping frequency bands, our brain merges these inputs together to form our perception of color. These 3 bands as every artist knows are the reflective primary colors of red green blue (RGB). The eye can't distinguish between a yellow light and mixed red and green lights. But for the mixed red and green light a spectrum analyser would not measure any yellow! The red and green will not pass through a yellow while the true yellow wavelength light will pass right through. To our eye there are millions of ways to form the same shades of yellow. The brain interprets the colors that eye sees in ways that help us deal and make sense of the environment, the colors and color intensities are relative to the surrounding. A red box surrounded by blue will look to be a different shade when it is surrounds by green. Also the brain interprets colors seperate from outlines. We all know that the brain doesn't care if we color the box and go outside the lines, the box will still look red. To end this long winded discussion IMHO there is no way that it is possible for each of us to see colors exactly the same way. Also as we don't reproduce colors using the real spectrum of light but instead use an imitation of our own visual system all media will look different from the original scene and also look different to each individual.